The Floating Piers – Christo & Jeanne-Claude’s stunning art installation at Lake Iseo in Lombardy, Italy. 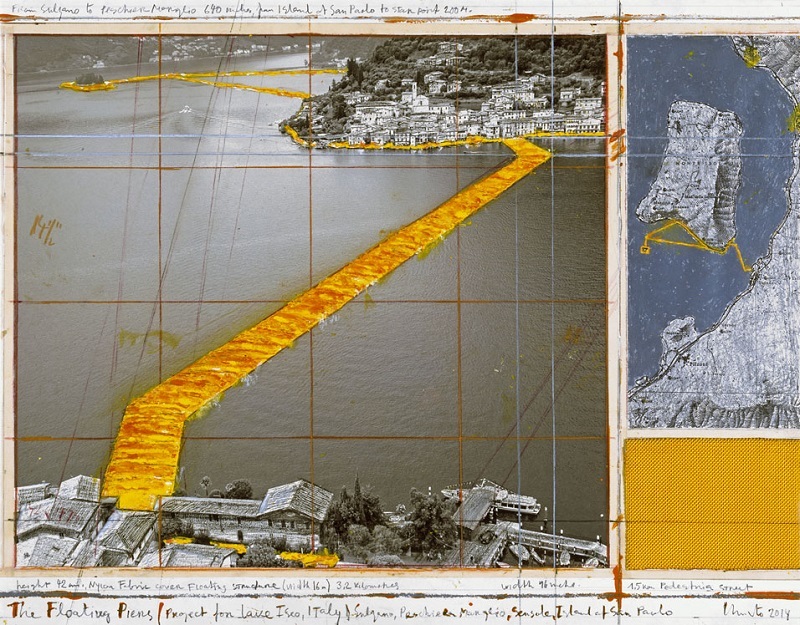 From June 18 to July 3, 2016, Christo will reimagine Italy’s Lake Iseo. The Floating Piers will consist of 70,000 square meters of shimmering yellow fabric, carried by a modular dock system of 200,000 high-density polyethylene cubes floating on the surface of the water. 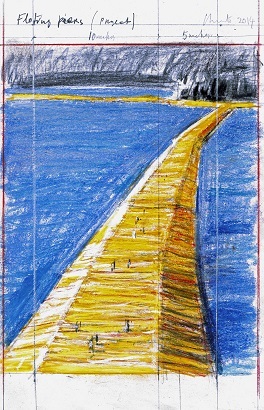 The avant-garde artist Christo has created some of the most spectacular large-scale artworks of the 20th century. 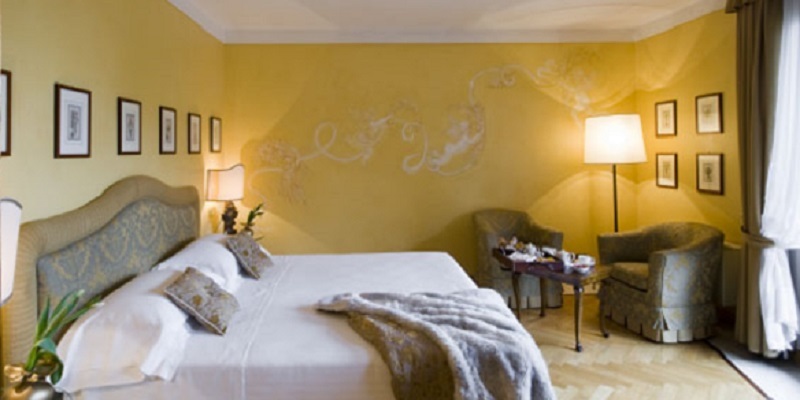 A charming 5-star resort in the fertile hills of Franciacorta a few minutes’ drive from Lake Iseo, l’Albereta Relais & Chateaux is an enchanting place off the beaten track. L’Albereta seduces its guests with refined proposals for haute cuisine, thanks to its new restaurant Leonefelice that finds a perfect complement in the Vistalago Bistrò and its stunning terrace over the lake Iseo and the Espace Chenot Health Wellness Spa. Visitors will experience this work of art by walking on it from Sulzano to Monte Isola and to the island of San Paolo, which it encircles. The mountains surrounding the lake will offer a bird’s-eye view of The Floating Piers, exposing unnoticed angles and altering perspectives. As the light changes throughout the day, the view of the piers will change too, from deep yellow to shimmering gold to a reddish hue when wet. Situated in the centre of Lombardy, a mere half-an-hour drive from Brescia and Bergamo and less than an-hour from Milan, L’Albereta is the ideal get-away for those seeking the pleasure of “some time-out”. L’Albereta seduces its guests with refined proposals for haute cuisine, thanks to its new restaurant Leonefelice that finds a perfect complement in the Vistalago Bistrò and its stunning terrace over the lake Iseo and the Espace Chenot Health Wellness Spa. Opened in 2014, Leone Felice is a refined restaurant, with a contemporary décor made of the best Italian design. The Executive Chef Fabio Abbattista, a former student under the great resident chef Gualtiero Marchesi here previously, proposes a cuisine based on the excellence of ingredients, most of which come directly from the land where L’Albereta is located. Here are bred exquisite chickens and rabbits, while vegetables, aromatic herbs and fruits are produced by the family vegetable garden and picked up every day by the kitchen team. The cuisine of Fabio Abbattista exhibits well-known flavours, exalting them with contemporary technique and combinations. The name of the restaurant is a tribute to the old guardian and gardener, Leone. He has always taken care of this house and garden with love and joy. 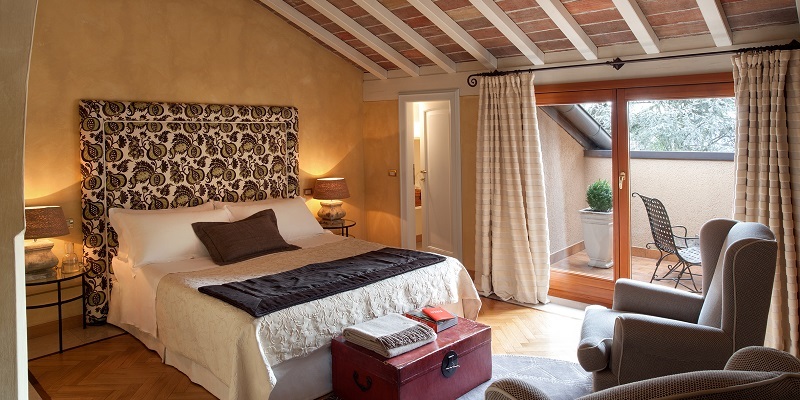 Welcomed in the most ancient rooms of this 19th Century villa, with beautiful frescos and Latin motti about the art of hospitality, the Vistalago Bistrò is the vibrant heart of the hotel. The perfect location from breakfast time till after dinner, it proposes delicious snacks all day long and a special selection of typical Italian and regional dishes for lunch and dinner, such as Tonnarelli pasta with pecorino cheese and black pepper sauce and Milanese veal chop with fresh lettuce. Its amazing terrace seems to float among the green of the park, offering a breath-taking view on the Iseo Lake and Montisola island. Espace Chenot Health Wellness SPA at the Albereta is a place of absolute wellbeing, where you can pamper yourself thoroughly, based on a rigorous method rooted in the principles of medicine that can restore the body to its peak mental and physical condition. Espace Chenot is one of Chenot’s only two medical & wellness spas in Italy, with a 30-strong team of highly qualified doctors, therapists, dieticians, osteopaths, beauticians, and of course receptionists and welcoming team. Designed by architect and AD Italia director Ettore Mocchetti, Espace Chenot expresses in its architecture – a balance of full and empty spaces, with light and shade and water games – the same search for harmony that animates his raison d’être. His balance of shapes represents the mental and physical equilibrium that can be achieved here, where you can purify the body and restore forgotten energy and vitality, a regained equilibrium leading naturally to a new and luminous beauty. At Espace Chenot, peace and quiet reign supreme. Everywhere natural light is moulded as if to protect this 2.000 sq. m. space, which is separated into two levels. First comes the reception area, featuring soft shapes and curved lines that invite you to relax and let all the tension ebb away. Next is an area with more decisive lines and volumes that is devoted to medical analysis, with areas for energy tests and diet assessments. Symmetrically opposite reception is the herb tea area, which serves each day a different selection of tisanes with draining and antioxidant properties. Suffused with natural light thanks to a zenith skylight, it extends into the park with treatment booths, allowing complete privacy and direct contact with nature, thereby maximising the effects of the therapy. The ground-floor area, which leads straight out into the park where large contemporary sculptures are arranged, is devoted to water treatments and water fitness. The main feature is a vast pool with counter-current swimming and five different types of hydromassage, and next to it the sauna and Turkish bath and aromatherapy facilities. There is also a spacious gym with latest-generation Technogym equipment and a lovely bow-window overlooking the garden, where a session on the treadmill is equivalent to a run in among the holm oaks and cypresses in the park. Last but not least, right in the heart of this delightful place, is a circular area set aside for hydrotherapy, and phyto-mud and hydrojet treatment. A hidden refuge, a maternal womb, giving new life in this temple of wellbeing and beauty. Reserved for guests enjoying treatments at the Espace Chenot Health Wellness SPA, the Wellness Restaurant offers a range of recipes created by Dominque Chenot and perfected by her and a team of experts, designed to offer both balance and flavour. The Wellness Restaurant at l’Albereta is living proof of this. In this finely furnished dining room, which stretches out with its magnificent bow window among the trees and flowers of L’Albereta park, as if seeking to become at one with the surrounding nature, guests are seduced every single day by dishes that delight both the eyes and the palate. Rather than a rule, it therefore becomes a pleasure following the personalized diet drawn up by expert dieticians, an essential adjunct to Henri Chenot’s treatments. 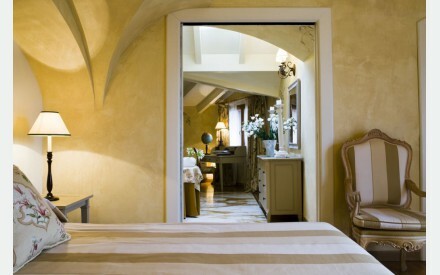 L’Albereta has 38 rooms and 19 suites, each one different from the next. Every room is the result of a skilful combination of love for the beautiful and the desire to provide maximum comfort. Refined rooms enriched with furnishing details that are the fruit of sophisticated research. Each is different from the next: one has a balcony, the other is an attic, and some boast a lovely entrance lounge. Fine marble bathroom with shower. Possibility of French style connected bedrooms. Light-filled rooms, all have private balconies, immersed in the peace of the park. Satin and damask in warm golden tones are used for the furnishing textiles and on the walls there are delicate frescoes and decorations. Bathroom with tub, in some a Jacuzzi, and the possibility of French style interconnecting bedrooms. Fine, roomy bedrooms in warm nuances, delicately furnished with period furniture in masterly combinations with exclusive details from all over the world. Each bedroom has its own individual colours, décor and textiles. Bathroom with valuable finishing touches and, in some rooms, hydro-massage tub and shower. 30/35 m2 – 2 persons + sofa bed for 1 person in some of the De Luxe. 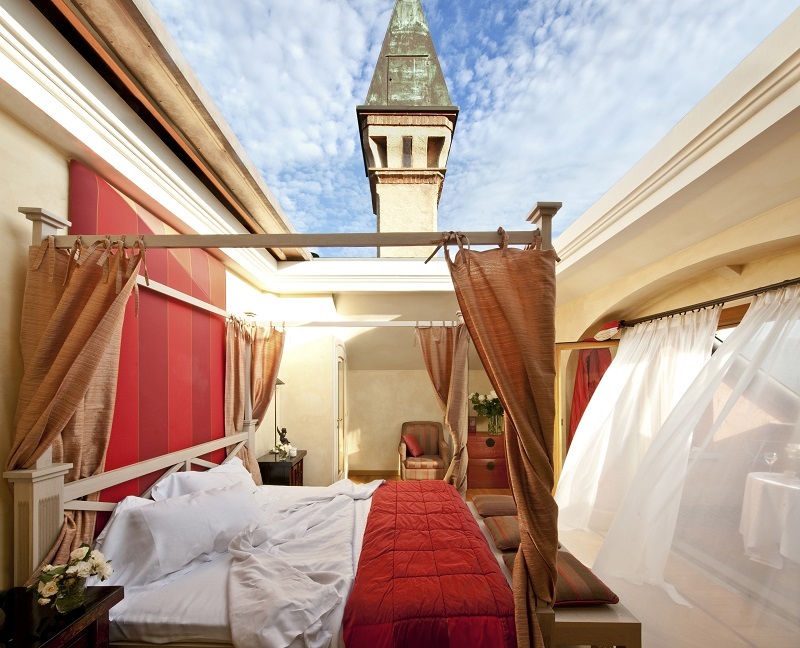 Romantic bedrooms situated in the nineteenth century Villa, Lake Tower and Casa Leone, with small entrance lounge and roomy bedrooms. Each is different from the other: soft nuances alternate with stronger tones. Many have an elegant four poster bed, others are attics. Fine marble bathroom with hydro-massage tub and, in some cases, multifunctional shower. 38 m2 – 2 persons. Large suites of pastel tones with independent lounge, refined furnishings, flooring with fine marble and wood inlays and, in most bedrooms, elegant four poster beds. 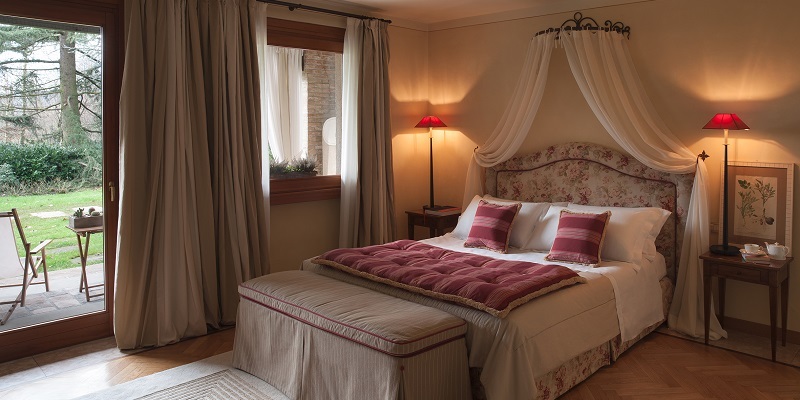 All are fitted with a delightful balcony with view of the park, vineyards and, in some cases, Lake Iseo. Bathroom of pink marble with hydro-massage tub and multifunctional shower with sauna and Turkish bath effect. 45 m2 – 2 persons + sofa bed for 1 person. 30 m2 – 2 persons. Perfect for a family. Each suite is composed of two adjoining bedrooms located on two floors, connected by inside stairs. Furnished with refined elegance and positioned on the last two floors of the Contadi Tower, from where an evocative panorama of the Vigna Leone, L’Albereta’s private vineyard, can be enjoyed. They are fitted with a double bathroom with hydro-massage tub and shower. 50 m2 – 4 persons. 60 m2 – 2 persons + sofa bed for 1 person.